Ryanair has confirmed it plans to close all of its airport check-in desks by the end of the year in a bid to reduce the cost of its flights. 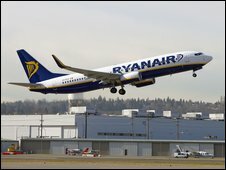 From the start of 2010, all Ryanair passengers will need to check in online in order to confirm their flights. Officials at the Irish airline said that by reducing its costs at airports, savings would be passed on to passengers through lower fares. The carrier said that 75% of its passengers already checked in online. Spokesman Stephen McNamara said the airline saw the move as the "logical next step" in an effort to pass on savings to passengers through reduced fares. Ryanair chief executive Michael O'Leary told the Daily Telegraph that passengers will be able to leave their luggage at a bag drop but otherwise everything will be done online. "Ultimately, we want just one in five people to check in luggage," he said. The carrier said that 97% of passengers booked online already and 75% used the internet to check in.